NOTE: Online ticket sales for this event have closed, but tickets will be available at the door! Say “hallo” to November and the holidays with Brats & Brews: German Beer Garden & Artisan Market on Friday, Nov. 2, at the Tallahassee Senior Center, 1400 N. Monroe Street. 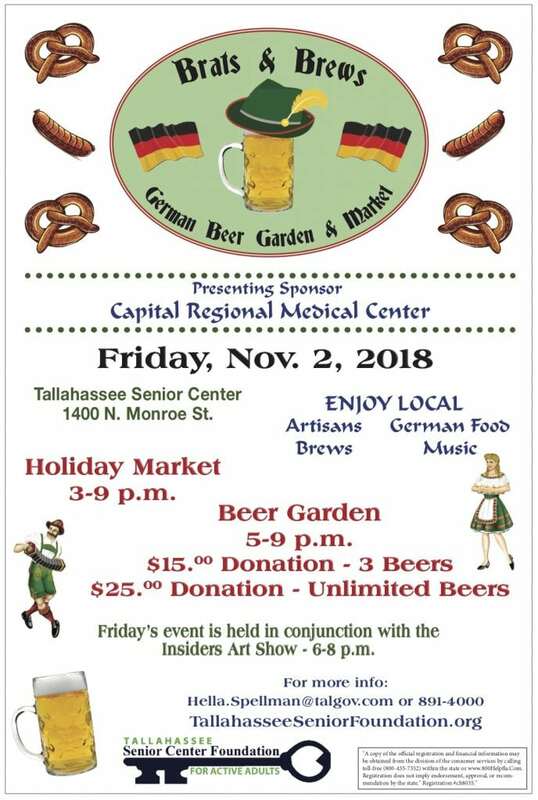 This fun, German-inspired event, hosted by Tallahassee Senior Services and sponsored by Capital Regional Medical Center, will feature food, brews and handmade crafts by local artists & vendors. The Beer Garden will take place from 5 to 9 p.m. and feature lawn games, themed foods like bratwurst, Bavarian pretzels, and beer from local breweries. To access the beer garden, participants must make a $15 donation for 3 beers or a $25 donation for unlimited brews and be 21 years of age or older. Pretzels and live music by Dave Carty will be sponsored by For the Table Hospitality and Home Instead Senior Care. For more information about becoming a vendor, call 850-891-4000 or email Hella.Spellman@talgov.com. Inside the Senior Center, peruse the Holiday Market from 3 to 9 p.m. and pick up holiday gifts for friends and family members. 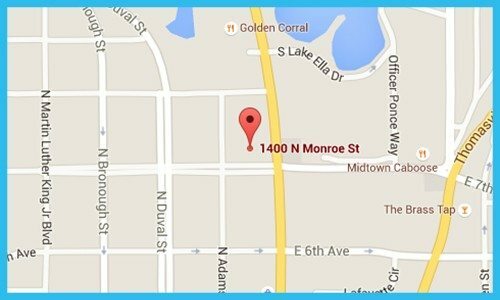 Admission to the market is free. For more information about Brats & Brews: German Beer Garden & Market, call 891-4000 or email Hella.Spellman@talgov.com. *Must be 21 years of age or older to access the Beer Garden. *You will be directed to PayPal for payment. If you do not have a PayPal account, you can still check out using a credit or debit card. The next opportunity to celebrate the holidays is Deck the Halls. Enjoy this festive, annual fundraiser on Friday, Nov. 30, at 6:30 p.m. as the Senior Center’s second-floor auditorium is transformed into a winter wonderland that features gourmet food, a martini bar, live music by Jazz Etcetera, complimentary valet parking, and a $500 cash giveaway. Shop for one-of-a-kind gifts during the silent auction. Sponsored by Audiology Associates of North Florida and the Tallahassee Senior Center & Foundation, proceeds from Deck the Halls benefit Tallahassee Senior Services, which offers classes, concerts and more throughout the year. Click here for more information and to purchase tickets. See how much fun we had at Brats & Brews last year in the photo gallery below!